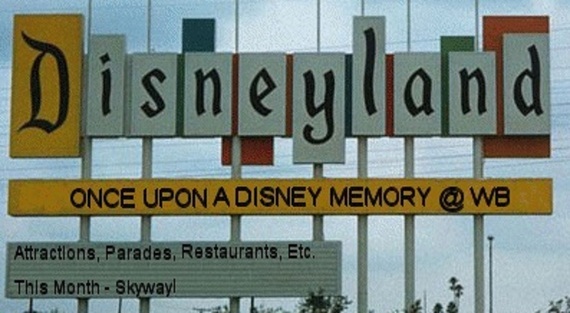 Once Upon A Disney Memory – Skyway! Walt’s Basement article written by Arthur Vassar. What memories do you have of this? The time was 1956… less than a year after the opening of Disneyland (which would see the parks overall number of visitors during that year coming in at over three and a half million) and Walt Disney was looking for ways to enhance the guests experiences at his park. This would be the year that “D” Tickets were introduced, and the first expansion would include an island in the middle of the Rivers of America (Tom Sawyer Island), Indian Village and War Canoes, Rainbow Caverns Mine Train, Storybookland Canal Boats, Astro-Jets and the first aerial tramway of its kind built in the United States, better know to Disney fans as the Skyway. 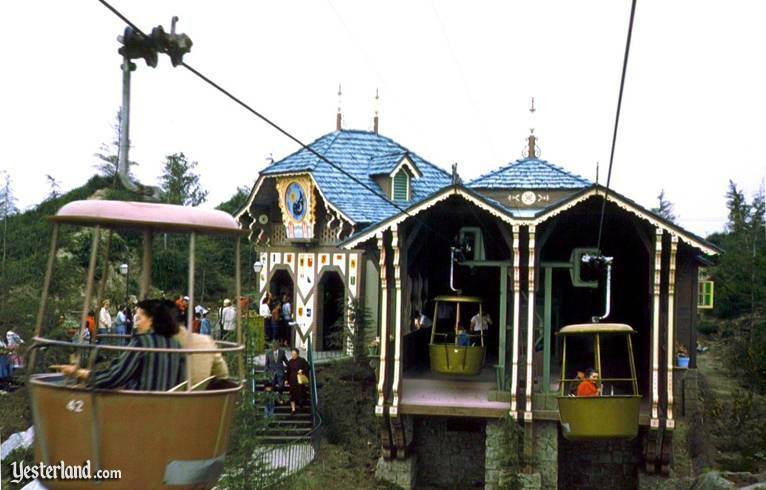 This gondola lift attraction was opened at Disneyland on June 23, 1956. Walt had seen these lifts on many of his trips to Europe and decided that his park should have one as a way to get guests from one part of the park to another. This was Walt at his best, seeing it as another new form of transportation… just like its successors the Peoplemover and the Monorail. It also gave guests a chance to get a birds eye view of the park. It was built by Von Roll Ltd. of Bern, Switzerland. 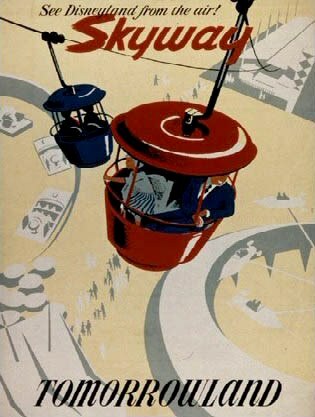 They were originally made with sidechairs for ski resorts, but since they were going to be used at Disneyland the Imagineers designed the bucket gondolas used when the attraction first opened. 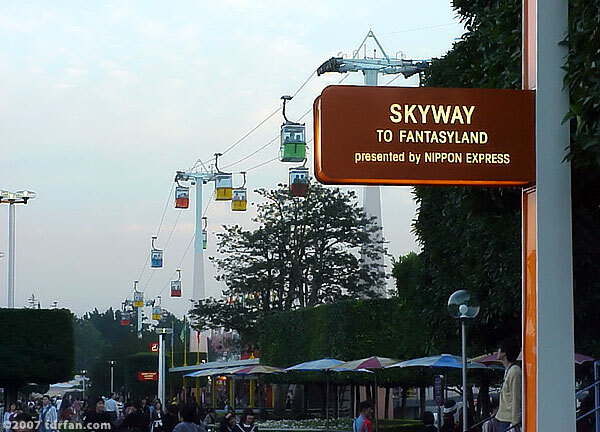 The Skyway was set up between Fantasyland and Tomorrowland. Originally tickets were one way (Skyway to Tomorrowland and Skyway to Fantasyland) and a short-lived round trip ticket. The stations as all things Disneyland matched their locations. Fantasyland station was designed to look like a Swiss chalet, while Tomorrowland station was given the futuristic treatment. People loved the opportunity to take a break from walking around the parks, and getting to see what was going on from above. Disneyland’s next major expansion came in 1959 when they added the Monorail, Motor Boat Cruise, Submarine Voyage and the Matterhorn. But what would happen to the Skyway? 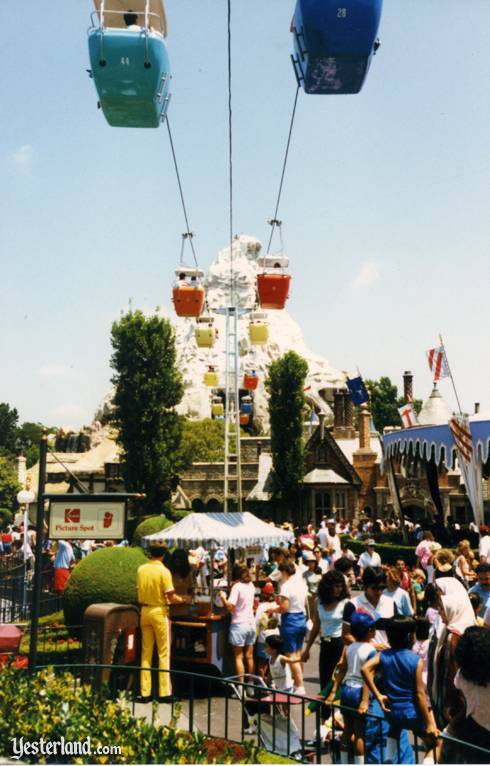 The Matterhorn was slated to be built right where the center cable tower was. In a brilliant move, the Imagineers built the Matterhorn to accommodate the Skyway, complete with openings for the two cable runs. The mechanical parts were now hidden in the mountain. 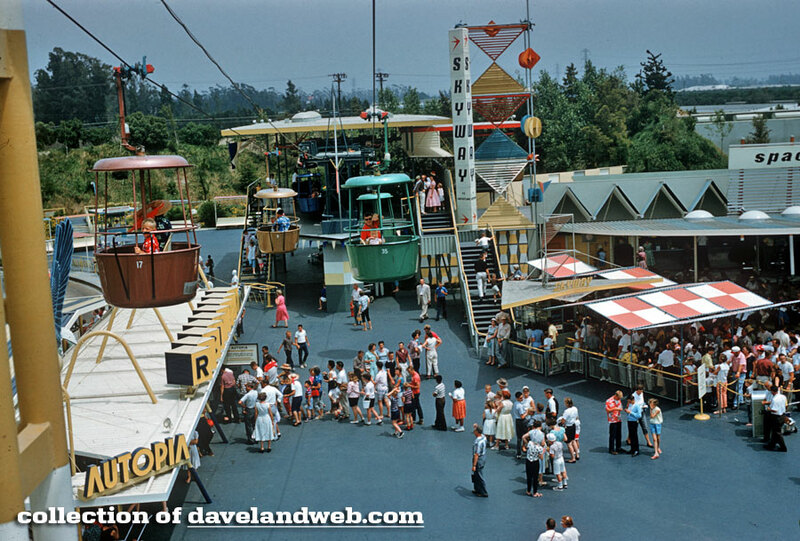 When 1965 rolled around guests entering Disneyland were in for a change. 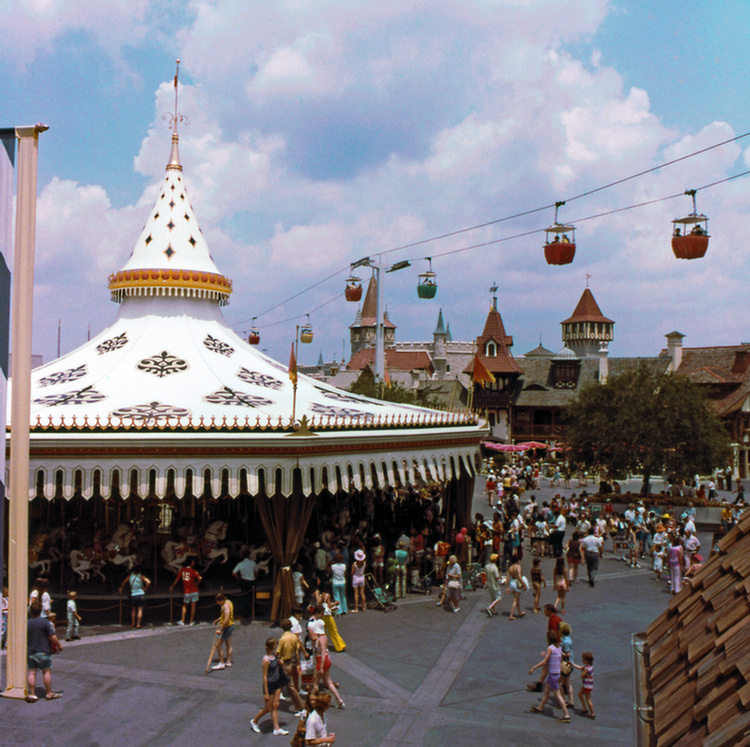 The familiar bucket gondolas were replaced with rectangular ones. In 1971 when Walt Disney World opened, guests were greeted with many familiar attractions including the Skyway. There was a third location for the Skyway when Tokyo Disneyland opened on April 15, 1983. Getting back to the original Skyway, the mid-1980s Fantasyland renovations did cause the Fantasyland station to be closed for a time, and the round-trip returned to the Tomorrowland station during the work. The 1990s saw the end of all three versions of the Skyway. First to go was the Disneyland Skyway on November 9, 1994. According to reports it was due to stress cracks in the Matterhorn roller battery supports and overall metal fatigue of the attraction. When the word came out that the Skyway was closing fans rushed to the park to get in their last rides. 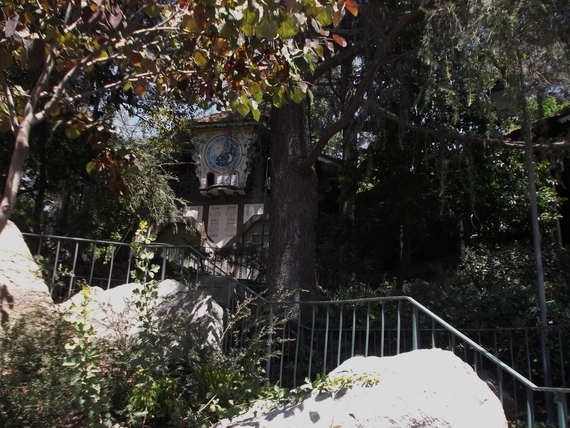 If you visit the park now, the only visible reference to the Skyway is the old Fantasyland station. 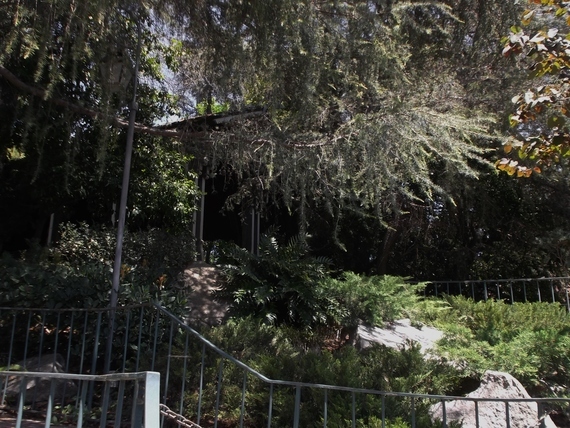 It is still there hidden amongst the trees, but slated to be demolished soon due to pests and a weakened structure. Next was the Tokyo Disneyland Skyway that closed on November 3, 1998. The Fantasyland station was removed to make way for a new attraction (Pooh’s Hunny Hunt) and the Tomorrowland station was re-purposed as a candy store. Lastly, Magic Kingdom Skyway ceased operation on November 10, 1999. The stations stayed around for some time, but in the summer of 2009 the Tomorrowland station was demolished. After a life as a stroller parking area, the Fantasyland station was demolished to make way for a Tangled themed restroom structure in 2012. But is this the end of the Skyway story? For the Disney parks the answer is yes, but there are still many examples of the Von Roll aeriel tram still in operation around the world. The best known (and closest to Disneyland) are the The San Diego Zoo Skyfari and SeaWorld Bayside Skyride. They also still exist in three state fairgrounds (Minnesota, Oklahoma, and Washington) and international locations from Israel to Germany to Indonesia. The Skyride at Cedar Point in Ohio was built in 1961, using some of the Disney blueprints for its drive and tension systems, and is still fully operational to this day. 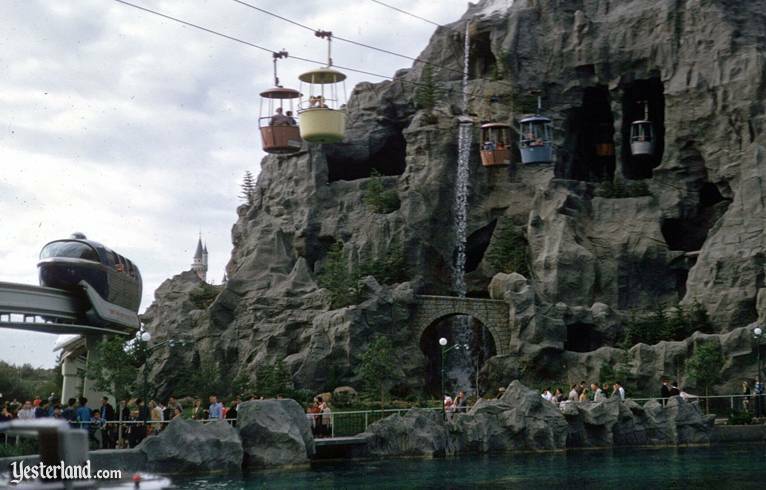 The attraction has also spawned many fan groups around the world and individuals who create their own model versions of the Skyway. Here is a video made by a friend of mine who creates marvelous gondolas and has a fully operational Skyway in his backyard. So you see… the Skyway may be gone from the skies of the Disney parks, but they are definitely not forgotten! Original article can be seen at http://waltsbasement.yuku.com/topic/44786/Once-Upon-A-Disney-Memory-Skyway#.VT_CpSFVhBc.